September began well, sunny and 87 degrees!Old weather lore says that “Whatever the weather on the first day of September, the rest of the month you’ll see!” It was clear and sunny and that’s the way much of the month has been, beautiful autumn days with just enough rain to keep the plants happy! It’s been a wonderful beginning to the autumn season. I even took time to take down the spring (yes, spring!) décor on my kitchen shelf and put up the fall leaves, my brown tea pot collection, and the colorful wooden pumpkins my dad made for me years ago. Although we continue to have some warm days, there’s no doubt about it…..autumn has arrived. The lawn is littered with fallen leaves and black walnuts, the air has a chill in the evenings, and the jeweled colors of the annuals have intensified to attract the last of the pollinators. Grasses are dropping seeds and goldenrod explodes with color. Combines have begun their work in the fields. It’s time to complete the harvest from the gardens. The cupboards are filling with jars of dried herbs, herb blends, and tea mixtures that will be savored throughout the cold months ahead. They will provide inspiration for dozens of new recipes and flavor combinations, cold remedies and fragrant baths, all conjuring up memories of summer that will make winter bearable. The freezer and shelves are packed full of produce from the potager. There are still lots of peas, spinach, lettuce, radishes, peppers and more waiting to be harvested but soon frost will bring an end, and it will be time to plant the garlic and spring bulbs! How did the summer go so quickly? 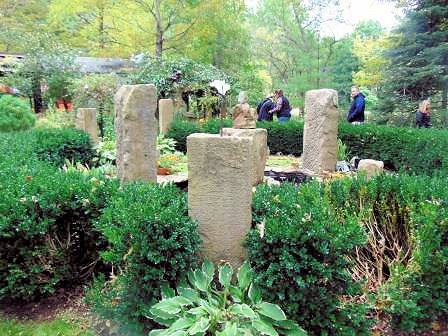 The Herb Society of Central Indiana will host its annual Education Night at 6:45p.m. on Monday night, October1st at the Clay Township Hall (corner of College Ave and 106th St.) in Carmel. It’s “An Herbal Halloween” night! There will be brief presentations on using herbs, some make-and take projects, including an herbal broom to hang in a window to ward off evil spirits, and a buffet of delicious herbal refreshments. This event is open to the public, and it’s FREE! It’s a great opportunity to learn about herbs and meet some wonderful people. *Apples and roses are from the same family? Apples, peaches, pears, and plums are all from the Rose family (Rosaceae). Almonds, strawberries, and cherries are too. If you look closely at the flowers on these herbs, shrubs, and trees, you will notice the similarities. Flowering plants from the Rose family have a cup-like shape with five petals and oval-shaped leaves. While lovers often give each other roses as gifts, students often give their teachers apples. Where did this tradition come from? Historically, apples have been associated with nutrition. Giving an apple to a teacher is a symbolic way of wishing your teacher good health. Does an apple a day truly keep the doctor away? Many fruits and herbs from the Rose family have health benefits. *Having fresh-cut flowers in your home may lift your spirits and speed healing. *Dahlias were native to Mexico, but did not become popular in Europe until the 1800s when some 10,000 varieties of dahlias were introduced and for a while were as popular as roses. Josephine Bonaparte grew several rare dahlias at Malmaison and because at that time a dahlia could be traded for a diamond, she did not allow anyone else to care for them fearing they would be stolen. 1) It’s a good time to collect seeds and store them for next year’s garden. 2) It’s also a good time to take advantage of season-end sales, and stockpile mulch to put on the garden after the ground freezes. 3) It’s time to plant garlic. Be sure you get hardneck varieties. 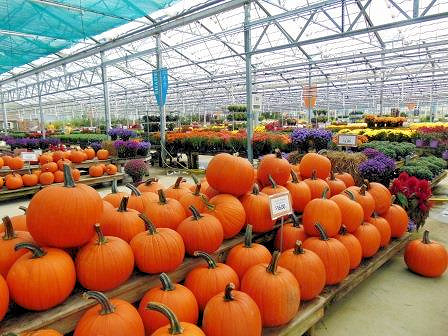 The softneck types generally sold in the grocery are soft-neck and will not survive winter temperatures. 4) It’s a great time to make a cold frame, so you can plant late-season salad crops that will last far into frosty weather with that little bit of protection a cold frame provides. You can also use it to pre-treat bulbs for forcing, and you’ll be thrilled to have it to get a jump start next spring. 6) Dahlias should be dug, cleaned and stored as soon as their leaves are frosted. You can write the color or variety name right on the bulb with a permanent marker. 7) Keep newly planted mums and asters well-watered to help their return next year. 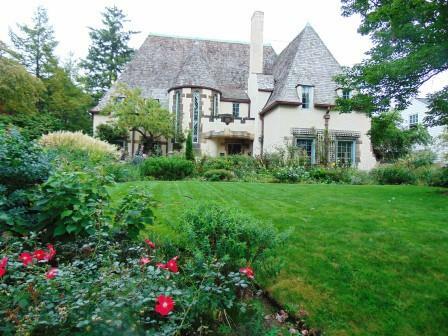 Last weekend I attended a Garden Writers’ Meet-Up in Cleveland, which included visits to major horticultural businesses and also private gardens. 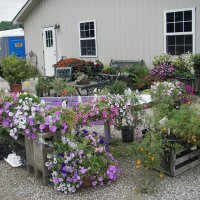 Our first stop was Willoway Nursery, a wholesale grower providing trees, shrubs, and perennials to independent garden centers throughout the Midwest. (NOT to big box stores!) 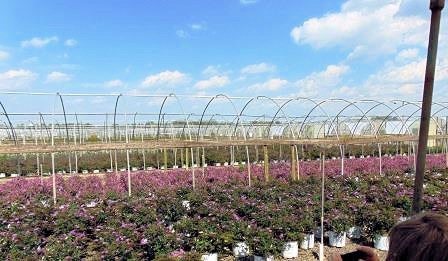 Over 1,000 acres are devoted to growing great plants that will do well in our geographical area. Fortunately, we were able to travel through the growing areas in padded seats on tractor-pulled wagons rather than walking and have knowledgeable employees answer our many questions. 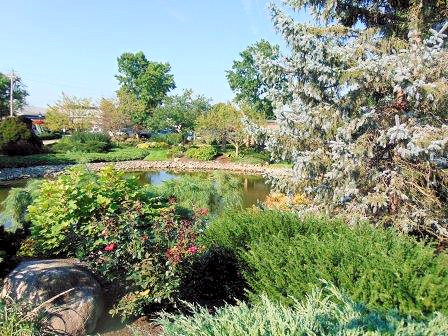 Next on the agenda was a visit to one of Ohio’s largest garden centers, ward-winning Pettiti’s. 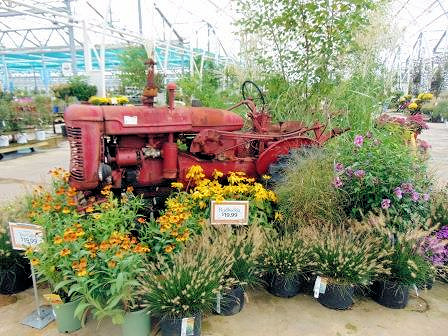 A trip there is always a delight, not only for their excellent plant offerings, but also just to see their interesting displays, such as this tractor surrounded by plants. 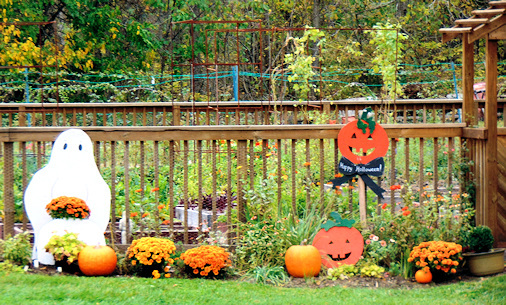 The colorful pumpkins and mums shown here are just a tiny glimpse of the massive display areas. 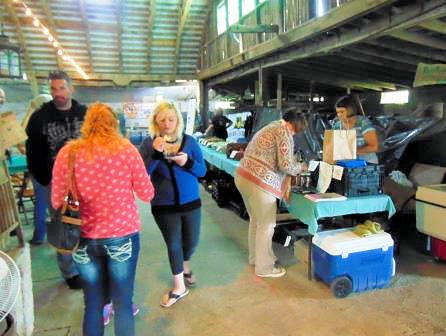 In addition to the outdoor areas, there are also two large indoor areas filled with garden décor and supplies, seeds and bulbs, gourmet foods and clothing. Such fun! You’ve probably heard about the “Just Add Ice” orchids, available in many groceries, big box stores, flower shops and garden centers. The brand is the work of Green Circle Growers, a massive enterprise that grow not only orchids but also several varieties of houseplants! 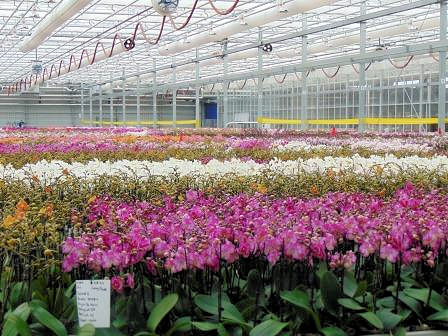 It’s the acres and acres of gorgeous orchids that begin life as tiny tissue culture that are the main attraction. 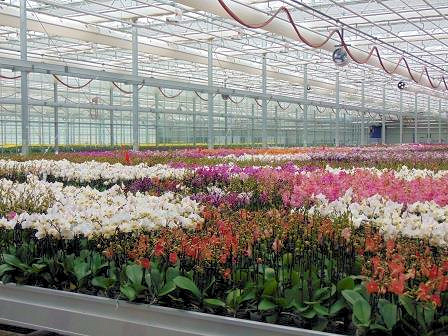 The automation used throughout production is just as impressive as the hundreds of thousands of orchids, from the tiny miniature varieties (the favorite of millennials) to the wide range of colors in the full-sized ones. The following day two private gardens were on the agenda. 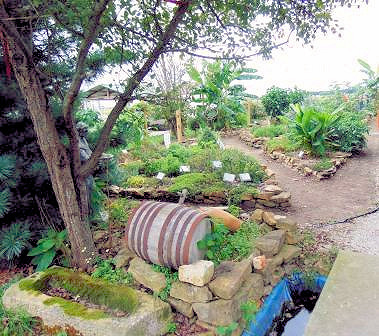 Nancy Drobnick’s expansive “meditation” garden along the river would take hours to explain. Based on mathematics, transcendental philosophy, astronomy and more the carefully mapped garden paths leads from one area to another in an invisible spiral. 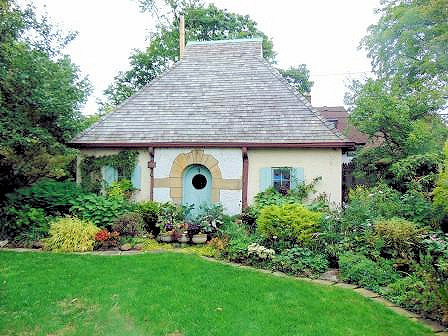 Owner of an award-winning landscape design company, the garden is a showcase for prospective clients, and also used for entertaining, as well as just for relaxing “down-time” to recharge her batteries between projects. 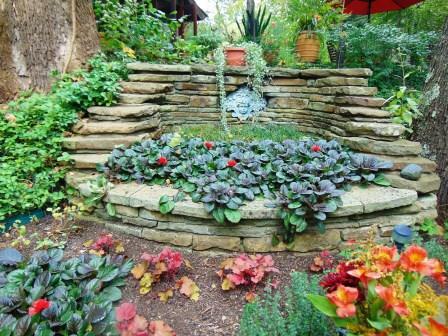 It contains lovely, but also meaningful if you understand the math and philosophy, stonework throughout the garden. Centerpieces are the meditation house near the center and an exquisite tea house nearer the river. On the way home, I stopped at Mulberry Creek Herb Farm to attend their garlic festival. Since I arrived in the waning hours, the selection of garlic was slim and the cooking demonstrations were already finished, but it’s always a worthwhile family-owned business to visit for a wide selection of herb plants, rarities, and miniature plants or just to visit their gardens. I’ll be writing more about the stops on this trip at my blog, https://herbalblessingsblog.wordpress.com in the coming month, if you’d like to learn more and see lots more photos. This is the time to pick all the lovely green tomatoes that will not have an opportunity to ripen before frost. You won’t believe how delicious this sandwich is! Cook 12 slices of bacon and set aside. Rinse and tear lettuce leaves to sandwich size. Heat 1 T. oil and 2 T. butter in a large skillet over medium heat. Slice 2 large green tomatoes ¾” thick. You’ll need 4 big slices, or smaller combinations to fit the bread. Dip into milk and then into a mixture of 1 c. bread crumbs, 2 T. sugar, a dash of salt and a bit of freshly ground pepper, covering the slice on all sides. Brown slowly and evenly on both sides. Toast 8 slices of thick bread. Spread generously with Aioli sauce. Divide the bacon and lettuce between the 4 sandwiches. Add the tomato and top slice of bread. Enjoy! I’ve spent most of September in the gardens or the kitchen preserving the harvest. Soon, before frost arrives, I’ll be moving plants back under cover. Then, I’ll concentrate on planting garlic and bulbs, readying the Lady Cottage for the winter, and hopefully blending some new herbal teas before cold weather arrives. Till next time, enjoy the color and sounds of autumn.